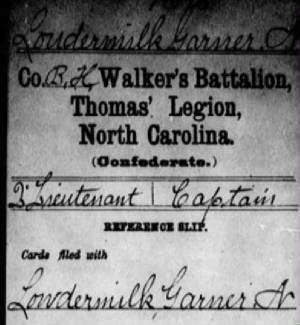 Garner N. Loudermilk: born 1818, Knox Co., Tennessee; mustered into Confederate service as a Lt. on July 19, 1862, Company B, Walker's Battalion, Thomas' Legion of Indians and Highlanders; promoted to Captain March 5, 1863, transferred to Company H, Walker's Battalion, Thomas' Legion of Indians and Highlanders; died June 3, 1883, Arkansas; buried at Mt. Zion Cemetery, Greenwood, Sebastian Co., Arkansas. 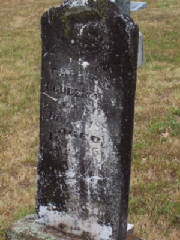 He served during the "Trail of Tears" in 1838; his headstone was inscribed "Aged About 55" and appears to be incorrect since his age was closer to 65. 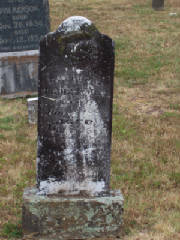 On Feb. 22, 1864, Major (later Lt. 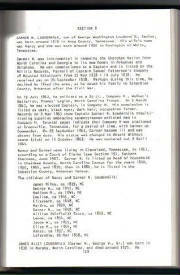 Colonel) James A. McKamy wrote to Samuel Cooper (A&IGO). 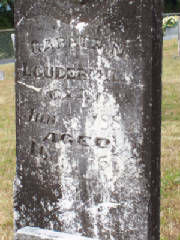 He stated that on Feb. 14, 1864, Captain Garner N. Loudermilk of Company H, Walker's Battalion deserted to the Federals, and McKamy further stated that on Feb. 14, 1864, Loudermilk also signed the United States' Oath of Allegiance. In the same correspondence, McKamy stated that Captain William B. Nelson of Company B, Walker's Battalion deserted and refused to return to the command. They were the highest ranking officers to desert from Thomas' Legion. 1850 Federal Census of Cherokee Co., N.C. Historians, genealogists, antique dealers, and collectors of Civil War artifacts will find this concise guidebook of great value. But most of all it is of inestimable practical value to family historians, North and South, who are discovering the pleasure and satisfaction of compiling an accurate family history. "[A] must have for the individual researching Civil War soldiers, ancestors' military service records, Union and Confederate army records, compiled military service records (CMSR), and for the family genealogist." If you are remotely into genealogy, then this book is for you. She covers such topics as the importance of staying organized and how to go about it; where and how to look for information in libraries, historical societies, and on the internet; recognizing that just because something is in print doesn't mean it's right; and how to prepare to visit the home where your ancestors lived. Genealogy 101 is the first book to read when you want to discover who your ancestors were, where they lived, and what they did.